The second in line to the throne was flown by helicopter to the headquarters of Britain's elite spy agency for a secret visit amid fears members of the royal family could have their emails and social media hacked by spies. 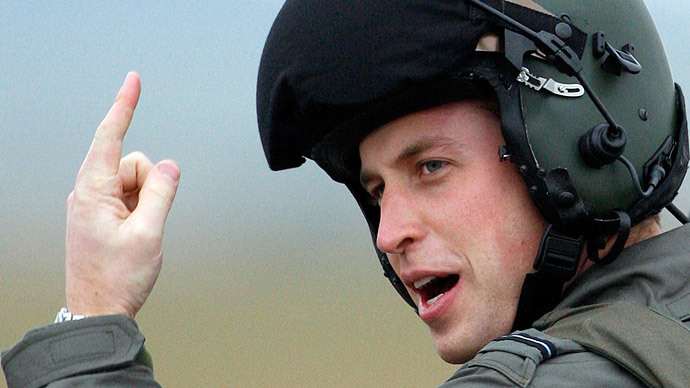 The four-hour visit to GCHQ took place on Friday and would likely have remained a secret if local office workers had not seen Prince William arriving at an airfield near Government Communications Headquarters (GCHQ) in Cheltenham aboard the royal family’s chopper. He was met by bodyguards, who then drove him onwards to the secure facility from which Britain conducts both global and domestic mass surveillance activities. “The prince paid a visit to GCHQ on March 19. As it was a private visit, we cannot go into the details of his itinerary,” a GCHQ spokesman told the Telegraph. “The visit was in a private capacity. The travel costs for it will fall within the official Royal Travel budget,” a spokeswoman from Kensington Palace, the prince’s residence, said. While details are scant it was reported earlier this month that GCHQ had picked up on electronic surveillance “chatter” which led them to suspect that royals – particular younger members of the family – could become targets for hacking by foreign intelligence agents. At the time an intelligence source told the Daily Mail, “Younger members of the royals - Harry, Kate and William, even Beatrice and Eugenie - have been warned they are targets of electronic hackers attempting to intercept their emails. “They are after any useful information about high-level government plans that could affect major companies or industries. In the financial world, advance knowledge is worth millions. One slip could cost millions in business. GCHQ's has been under scrutiny for its own surveillance activities recently. Last month, a tribunal ruled that mass surveillance of internet communications by GCHQ was “unlawful” until the end of 2014. The Investigatory Powers Tribunal (IPT) announced that the security agency’s access to information obtained by the US National Security Agency (NSA) was in breach of human rights law. The ruling suggests the intelligence-sharing operations between the US and UK were illegal for at least seven years, beginning with the Prism intercept program’s introduction in 2007 to the end of 2014.